Have you ever walked by the same shop window repeatedly and been drawn to the same item over and over again? Maybe you’ve even gone into the shop to check out the item, pick it up, try it on. You know you have, we all have, myself included. For the past few months I’ve been passing by the windows of the Bedford Mini Mall in Williamsburg, and every time I pass I’m drawn to the same thing, a series of delicate yet colorful bracelets in the windows. I’ve repeatedly gone inside to take a peak and often take an extra moment to stare in the window as I pass by. 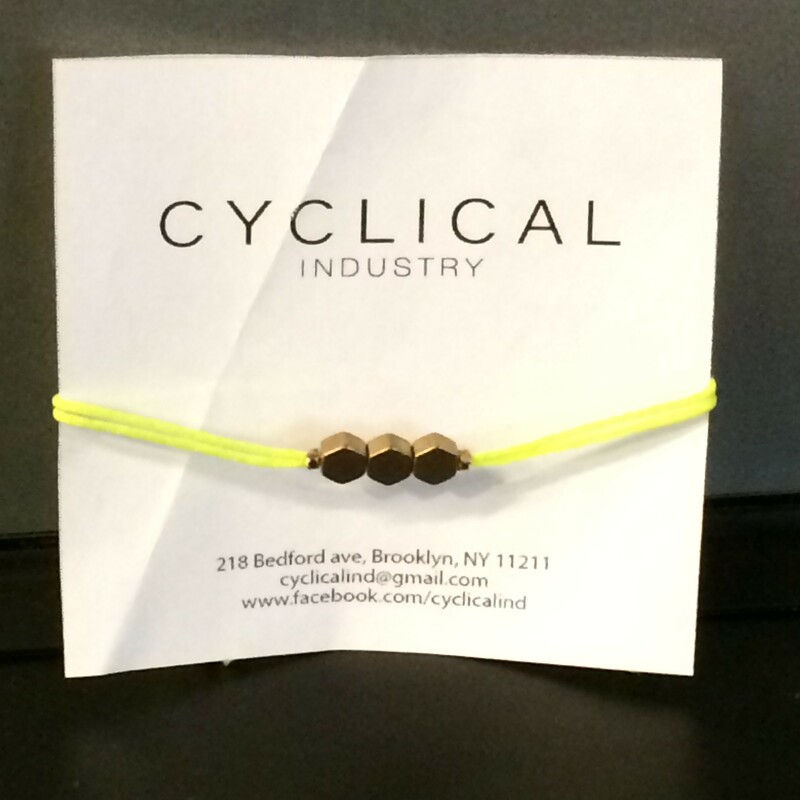 This past weekend I finally decided I had to have one of these bracelets and chose a neon yellow version from Cyclical Industry to take home. What I love about the bracelets is that they are so delicate looking, but in reality they’re quite durable. The bracelet string is actually a nylon cord and the metal seems to be a very strong and sturdy brass. Through a little research, I discovered that the Cyclical Industry jewelry line is designed by a married couple, one an FIT grad and the other a Parsons School of Design grad, and the line is actually cycling inspired (hence the name, duh). I’m already obsessed with my new piece and look forward to continuing to add other colors and metal designs from this designers to my arm party. 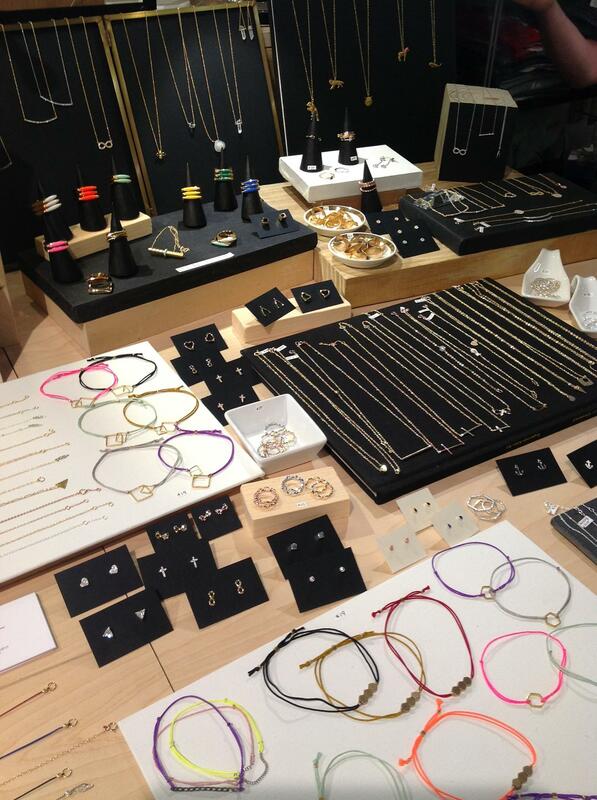 While the business is small, they don’t even seem to have a website yet, you can find and support them at the Bedford Mini Mall every day of the week, but if you’re unable to make it out to Brooklyn, you can also find some of their designs online at Bluefly or Vault. This entry was posted on Friday, May 2nd, 2014 at 9:38 am and is filed under Uncategorized. You can follow any responses to this entry through the RSS 2.0 feed. Both comments and pings are currently closed.